1969 - 2000 It is with deep sadness that Data Truck and its members note the passing of Marv Luke, whose title was Systems Engineer. Marv was born January 1, 1969 at Viborg, South Dakota to parents Joe and Karen Luke. At age two he moved with his family to Dell Rapids, SD. He attended Dell Rapids grade school and graduated from Dell Rapids High School in 1987. During his high school years and until 1990 he worked on the Ron Haney farm near Dell Rapids. He then attended and graduated from Southeast Technical Institute in 1990 with a degree in Electronic Technology and with a Batchelor of Science degree. He worked at Royal River Casino in Flandreau as an electrical technician. 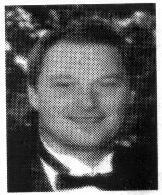 He then worked at Sioux Valley Wireless in Colman from 1991 until this October. On October 1st he accepted a position with Vyyo, a manufacturer of wireless internet equipment - the equipment used by Data Truck. Marv married Sherri Smith August 3, 1991 in Sioux Falls. After their marriage they lived in Madison until moving to Dell Rapids in 1992. he enjoyed NASCAR racing and working with computers. He was a member of the Dell Rapids Jaycees, he enjoyed playing pool and softball. He coached T-Ball for two years. Marv was a member of the Rustic Hills Community Church in Sioux Falls. Marv died Tuesday, December 19, 2000 at Avera McKennan Hospital. Grateful for having shared his life are his wife Sherri, his children, Michael and Mallery, both at home; his parents, Joe and Karen, a brother Jeff and a sister Laurie. Although Marv held full-time employment with Vyyo, he was also a key member of the Data Truck team. Marv could always be counted upon to come to the aid of anyone with a problem. With a cell phone as his constant companion he could talk anyone through any system problem and describe from memory the steps they would need to take to fix their problems. On the day he checked himself into the hospital, only a few days before his passing in December of 2000, he carried his cell phone and was even then assisting a user with a system problem. Before he took a position with Vyyo, Marv was one of their best representatives since he learned the Vyyo system quickly and was able to help others solve problems and keep their systems running. Not only did he help Sioux Valley Wireless and Data Truck, two businesses with which he had direct ties, but he also regularly provided assistance to other area users of the Vyyo equipment, at any hour of any day throughout any year. Not content to provide just verbal support, Marv would arrive on site and scale a 50 foot tower with the agility of a mountain goat to replace the equipment at the very top - doing this before most people would even suspect the origin of the problem. His skills as a troubleshooter are legendary. He will be truly and deeply missed by all who knew him.